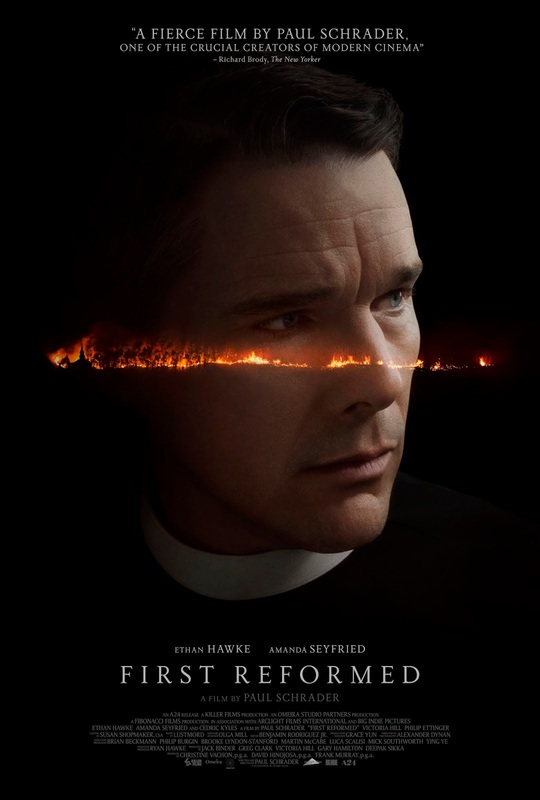 The most critically acclaimed movie of the year so far is this dramatic thriller written and directed by veteran filmmaker Paul Schrader (the man who wrote 'TAXI DRIVER'). It stars Ethan Hawke as a protestant pastor who begins to doubt his faith after his son is killed while serving in the military. The film costars Amanda Seyfried, Cedric ('the Entertainer') Kyles, Victoria Hill, Michael Gaston and Philip Ettinger. I found it to be a very depressing, and dark, near masterpiece. Toller (Hawke) is a protestant preacher, and former military chaplain, who's been slowly losing his faith ever since the death of his son (who enlisted in the military at his encouragement). His spiritual doubts are further complicated when a young woman, named Mary (Seyfried), asks him to council her husband, Michael (Ettinger). Mary's husband is an extremely depressed environmentalist, who's severely troubled by his knowledge of global warming, and the thought of bringing a child into our destructive world. Toller's depression hits a breaking point when he fails to help the young couple, and blames himself for their sudden tragedy. The movie is similar to 'TAXI DRIVER', in story and character development, but not quite as creepy or classic. It's still definitely disturbing though, and Hawke is outstanding in the lead. The global warming theme is very relatable, and effective as well. It's a near flawless film, and definitely not a feel good movie obviously. So be prepared to be left extremely disturbed by it, with very little life hopefulness or happiness left in you.